This Silverton 352 is your new home away from home! This spacious 41-foot Yacht features two state rooms, two heads with shower, well appointed galley and spacious salon. Above you will find multiple spaces starting with the extended swim platform, aft deck, fly bridge/drive station and expansive nose with unique full-size custom pad. 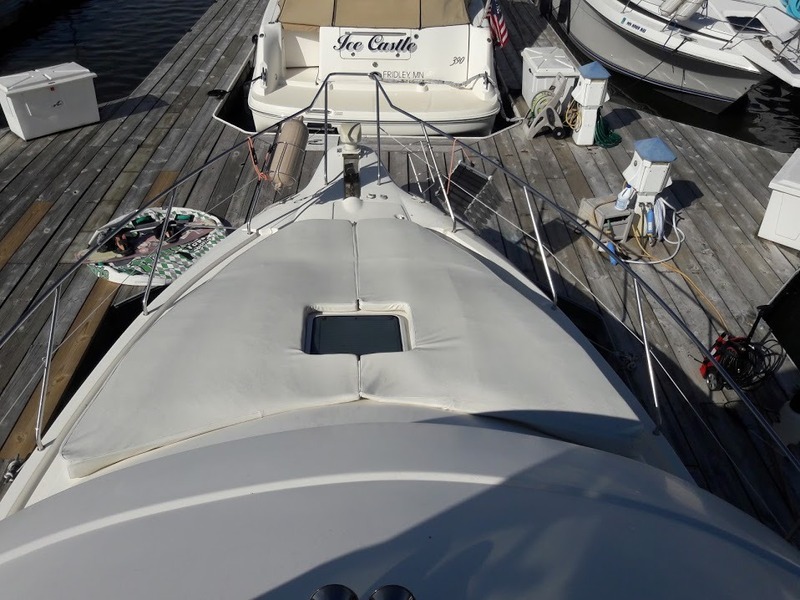 Stepping on board the Silverton 352, you will find an extended swim platform with space to sit and relax while you grill up your dinner on the water. Walk up the molded staircase to your new aft deck with wet bar and built-in ice maker. Sit and enjoy your afternoon on the river or throw on a show from Netflix to round out your day on the Samsung smart TV. Moving up to the fly bridge one of my favorite design choices is the rear facing bench seat along the front of the bridge. This design creates a great gathering area for sitting and talking with your guests while at anchor as the front seat faces the captain and side chairs. 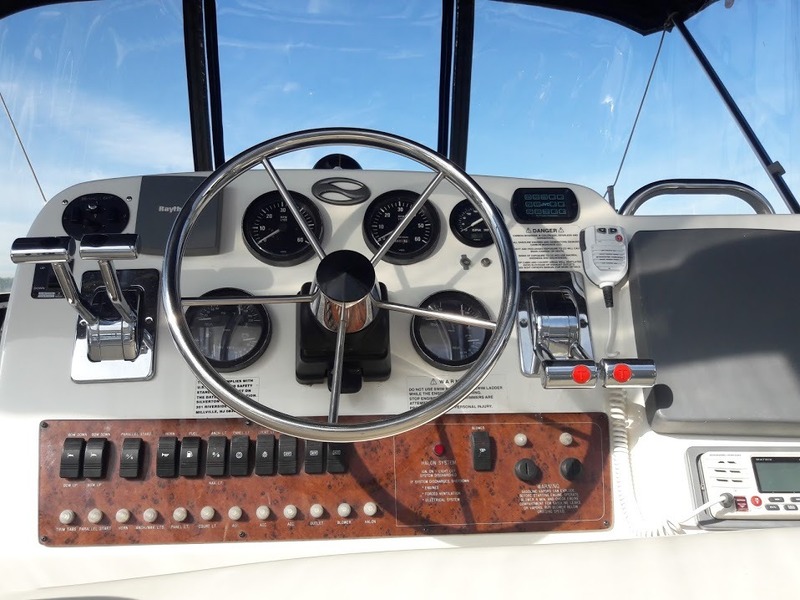 It also allows for great conversation with the captain, first mate and guests as you take a leisurely cruise up the river. No staring at the back of your guest's heads! The Silverton also features a unique "Sidewalk" design allowing for easy and safe access to the spacious nose. No need to walk along the outside of the boat to get to the front! This design also frees up space in the salon taking full advantage of the 13' beam. Want some time in the sun? 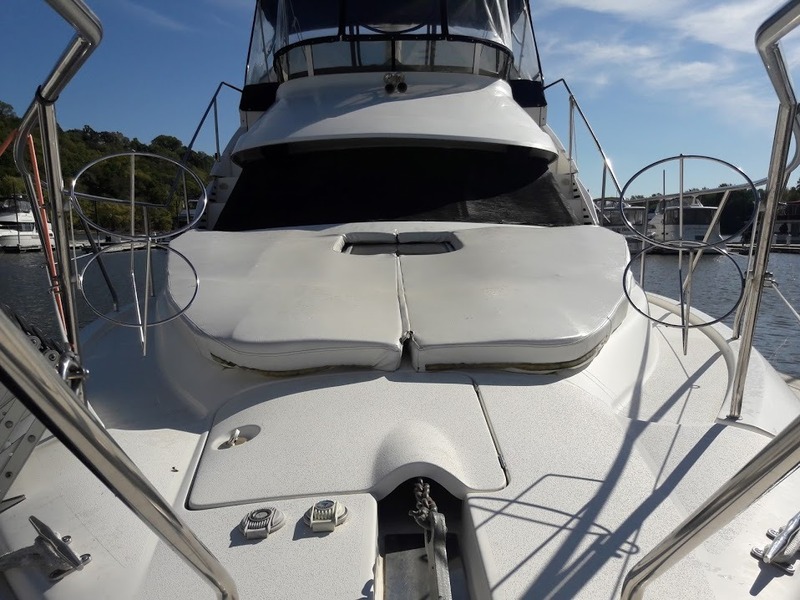 Step down from the fly bridge to the expansive nose where a custom made, full front pad awaits! This pad makes the nose a luxurious and comfortable gathering area for you and your guests! Moving inside you will find a spacious salon and galley. Throw a pizza in the oven and relax at night on the couch in front of your favorite show. Play a game with your friends or let the kid watch a movie while you relax up top! If it is still hot and you want a chance to cool off, the Marine AC will cool to your desired temperature. Full size refrigerator freezer and plenty of storage space including large pantry. Large table with banquet to feed the kids at lunch or have a romantic dinner with that someone special. The forward state room has two cedar lined closets and two drawers to keep extra clothes for the kids or your guests. The forward head includes a shower with glass shower door and vanity with additional storage space. For the captain and first mate, the spacious aft stateroom has ample storage space. Cedar lined closet, drawers for spare clothing combined with a large storage compartment behind the mirror provide space to keep extra clothes for a nice dinner out in Stillwater or a quick shuttle to the Casino at Treasure Island. The master includes a private head with separate stand up shower and dedicated marine air conditioner/heater. Plenty of additional storage for towels, toiletries and other essentials exist in the master bathroom.